Here are some photos from the 2003 Ghibli Museum short film Mei and the Kittenbus. 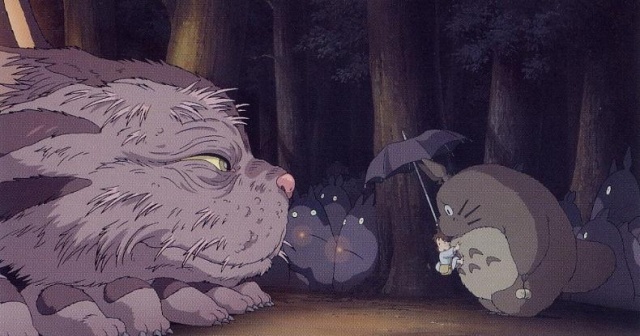 Directed by Hayao Miyazaki, this is a sequel of sorts to the beloved children's classic My Neighbor Totoro. Mei and the Kittenbus is fairly short, roughly ten minutes. 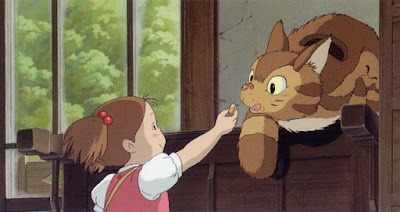 In the first sequence, young Mei playing around her family house until she discovers a new friend, the "kittenbus," who is a pint-sized version of Catbus. The two play and frolic around and have a good time. In the second sequence, Mei is awakened at night by Kittenbus, who takes her on a journey, where they discover dozens of "cat buses" of all shapes and sizes, and populated by hundreds of large Totoros. Everyone is joining together to meet the elder Catbus, the oldest and largest of them all (and voiced by Miyazaki himself). Here, Mei is reunited with Totoro, who is still carrying his umbrella. Everyone is happy and cheerful. Mei is returned to her home, and the story ends. 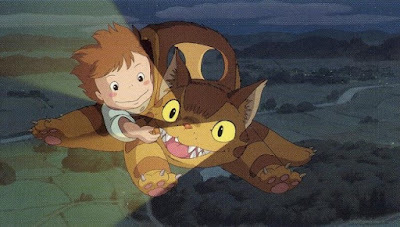 While this film, like all the Ghibli Museum short films, remain exclusively in Japan, Westerners can purchase the official art books, which include large screenshots detailing the stories. These are nice collectibles and very valuable for scholars who wish to discover this little-known aspect of Studio Ghibli. Will Mei and the Kittenbus ever be shown outside of Japan? Not likely, at least not while Miyazaki is still alive. The museum was created with a decidedly non-commercial approach, deliberately avoiding the mass consumerism of a Disneyland. Because of this, the museum's short films are intended to be seen only there, with no possibility of a home video release. Even after Miyazaki passes (hopefully not for many more years), Toshio Suzuki will likely still honor his friend's wishes. Whoever ends up controlling Studio Ghibli after the original founders are gone will likely decide the fate of these movies. But that's not a conversation we're ready to have, for obvious reasons. I'll gladly prefer to keep these movies in the vault in exchange for keeping Miyazaki around a little longer.